Not only is today Halloween, but this year is also the bicentennial of the book Frankenstein, which makes it a great day to pay tribute to 19th century goth queen Mary Shelley by watching a beautifully restored version of the original 1910 movie adaptation of Frankenstein. I never met Dettlaff, but it seems like everyone in film collecting circles has a story. Often they’re about the “Father Time” character he enjoyed portraying at film conventions, compete with robe, scythe, and hourglass to complement his long white beard. He was exceptionally protective of the Frankenstein print, traveling with it to film festivals and monster conventions. He even took it to the Academy of Motion Picture Arts and Sciences in 1986, where Academy President and famed director Robert Wise was unable to convince him to let the reel be properly preserved and archived. Eventually Dettlaff had the film transferred to DVDs he would sell at his appearances, and it’s rips from that DVD you can find on YouTube. Dettlaff died at home in 2005 surrounded by his film collection, including Frankenstein, still unpreserved. The Library of Congress bought the print in 2014 and has now had it beautifully restored. And finally—it’s alive!!!!!! And frankly it looks like Igor—another addition of the 1930s. 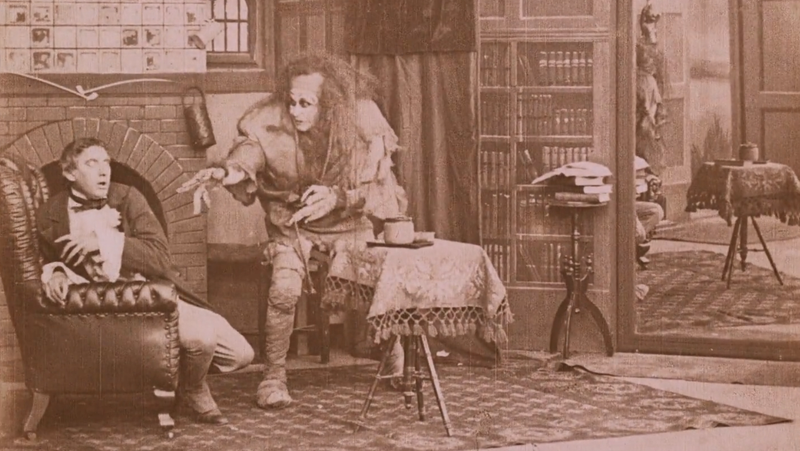 It’s easy to laugh, but these special effects must have been absolutely astonishing in 1910. And with the restoration—as opposed to the grainy, blurry transfers long available on YouTube—you can understand that so much better. Watch the movie here, or click through to the Library of Congress to watch in their incredible “screening room,” which has an entire week’s worth of things to watch.